I am happy to introduce you to Pam who blogs at From Apples to Zucchini. 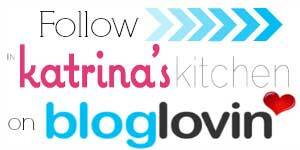 Her blog title sums it up nicely; Pam is always dishing out creative and varied tried and true recipes. She is a mama to a son about the same age as one of my little guys so we hit it off right from the start. She’s a smart cookie too- she brought a peanut butter cookie JUST FOR ME! (I kind of have a thing for peanut butter.) And she made cookie bars. Bars are good because you can keep skimming off little slivers all day long and no on will know the difference you can cut them into any size portion you need. 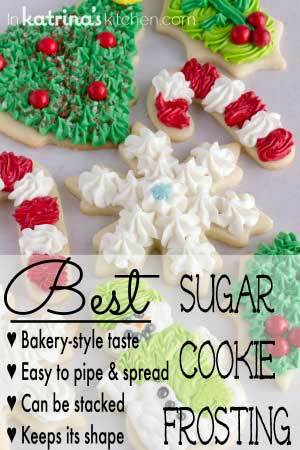 Perfect to bring to a cookie swap or divvy up between 7 billion cookie trays for friends and neighbors. ‘Tis the season! 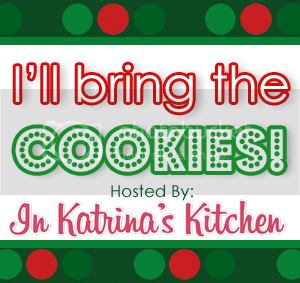 I am so excited to be participating in this awesome cookie shindig that Katrina is hosting and honored to be mingling with such amazing bloggers that I am so happy to call my friends. For those of you who might not know me, I’m Pam, and I share my kitchen happiness at From Apples To Zucchini. I feed my family as healthy as I can as often as I can, and provide them with treats along the way – its all about balance – right? This time of year, the baker in me busts out and cookies by the dozen start flying out of my oven, all to share with family and friends. 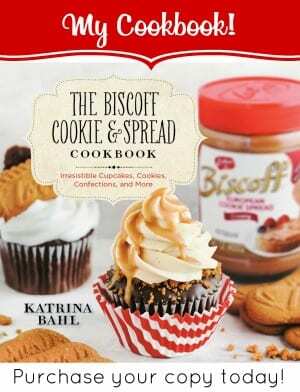 So, when Katrina mentioned a cookie party? Heck yeah I was totally in! When I started thinking about what to create for the occasion, I initially thought about something chocolate, when suddenly, it dawned on me – what better way to celebrate with my sweet friend than to come bearing a cookie full of one of her loves – peanut butter! 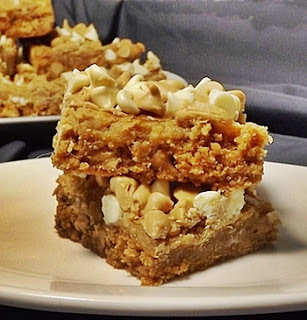 I call these peanut butter bliss bars for two reasons. One is obvious – biting into one is like diving straight into a vat of the good stuff. Second, they are a snap to make, and who doesn’t need an easy recipe to go to for a last minute party or dinner invite that will knock their socks off? I started out with shhhhh….a package of cookie mix…and a few ingredients later I had the most decadent, delicious bars you would ever want. 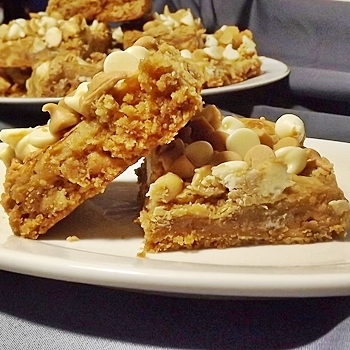 They’re almost…alllllmost gooey, but just slide under the wire to chewy, with a beautiful sprinkling of white and peanut butter chips on top to make them pretty enough for party going, yet just sinful enough to hide away with a plate in your room late at night. Don’t be afraid of the sweetened condensed milk – it’s not going to make the bars overly sweet, it just turns them into magic bars as it bakes into them. Seriously. Magic. I am not the biggest peanut butter cookie fan, but these? Holy cow! I had to get them away from me before I hurt myself! Hubby ate 3 or 4 of them before I could even get my camera out! If you have a peanut butter lover in your life and you love them, you need to make these for them. Mix cookie mix with egg, water and oil per package directions. Mix in one half bag of peanut butter chips. Press cookie dough down into a foil lined, sprayed 9 X13 pan. In a separate bowl, mix the condensed milk and peanut butter together until smooth. 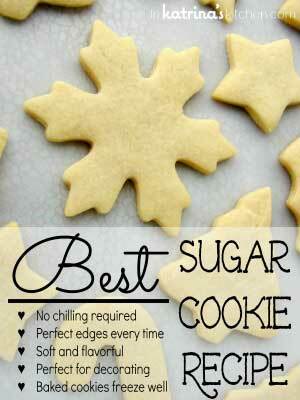 Spread over the unbaked dough evenly. Bake at 350 for 22-25 minute, or until the top is no longer wobbly. Remove from the oven and immediately top with mixture of remaining peanut butter chips and white chips. Shh…it’s HER BIRTHDAY TODAY! Aren’t you glad she brought treats to share?! 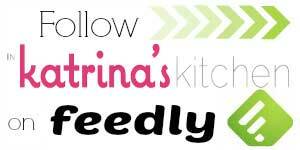 If you are new to Pam’s blog From Apples to Zucchini then you will want to check out her Cheesesteak Dip. She even makes her own Powdered Gingerbread Coffee Creamer! This is awesome! Can't wait to try! These are perfect for any PB lover, like me, and pure heaven. I can't wait to make them. thanks for sharing your recipe! Definitely no fear of condensed milk with peanut butter! All my favorites!! PB, white chocolate, and sweetened condensed milk! YUM! I love how dense these bars are~so yummy! Hooray fro peanut butter! All you had to do was say peanut butter… and I'm SO there! And then you went ahead and threw in sweetened condensed milk, one of my weaknesses. Yep, I confess, it is! my daughter would devour these. My recent post I&#8217;m Bringing Peanut Butter Bliss Bars! This is my dream dessert…especially with white chocolate chips. This is a WINNER! My recent post Muffin Monday: Chocolate Nutella Brownie Muffins! Peanut butter is the best! This looks so rich and full of peanut flavor, I'm in love 🙂 Gorgeous photos, it's making me drool! They looked so good I went to the store and bought the ingredients and made them. They smell SO good – not cool enough to eat yet. They will have to go to work with me tomorrow. I can never turn down anything peanut butter! Love that these start with a mix! Shortcuts around the holidays are great! I have so much catching up to do and so many of my friends are participating in the cookie party! I feel like Im at a great party but had to answer a very long phone call from an angry boss or something! 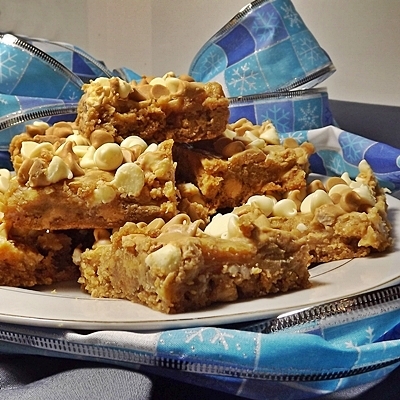 These peanut butter bars look great. Id be guilty of sitting with the tray and a giant glass of milk.